Home » Mum Favorites » How does your mum make you laugh? How does your mum make you laugh? Be stress-free & enjoy your time as a mother! 10 secrets of a HAPPY mummy. Do your kids see that you ENJOY being their mummy? Do they see you SMILE when you are with them? Do your kids see you laughing & being stress-free? We have to say that although we do feel busy a lot of our days, most of what we do is simply for fun. 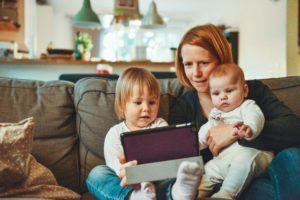 We do not like to put a lot of things on our plate, because we don’t like to feel rushed and it’s not good to pass that feeling of being rushed or stressed onto your children. For example, yelling at the kids to “hurry up” while getting ready for church in the morning is really sending the opposite message, isn’t it? Whats the big deal if we have to go to the 10:30 service instead of 9:00? Is there really anything wrong with that? This goes for just about everything: when you feel stressed, say to yourself “Ok- whats the big deal if I ____? 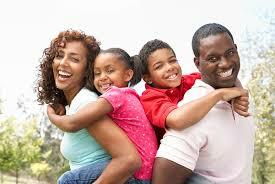 As long as you are taking care of your family, you don’t really have to stress over much else. Take it easy on yourself. If you are skipping something because you decided to play with your child… so be it! Let things go just a bit! Enjoy the moment that you are in right now! Even with 1 child, we are sure that they will each want to do activities as they get older. 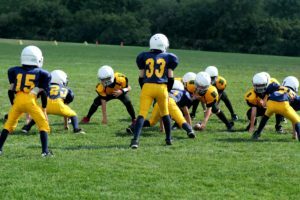 Right now our rule is one sport (or activity) per season, per child. It’s a good plan to keep it that way. You cannot have your children in boy scouts, baseball, soccer, gymnastics… that would send you crazy! The true point of being a Mummy is to keep our kids healthy and by rushing them around everywhere, You could be placing stress on them because you would be stressed yourself. It would be better for your children to be at home, playing outside and having dinner as a family instead of being in so many activities. you will find that even one sports activity takes up several nights a week. Don’t worry about “keeping up with the Jones’” to have your child in this activity or that activity, just because you think that you should. Let them pick on thing & do just that. Youth group? Great. Soccer? Great. Karate? Great. Just make sure that it works for your schedule. There is a soccer group here that plays on Sunday. That works great for us! Our weeks are free, which I love because the kids go to bed early (which is not the case, we are finding, with baseball)… which brings us to # 3. PS- here is my post on teaching your kids to sleep later. If you kids aren’t feeling well, there is nothing like a hug from Mom to make them feel better. (This was actually shown in a study.) HUGS ARE PROVEN TO HELP OUR KIDS… DO IT MORE OFTEN. Plus, it raises endorphins in both you & your child, so you both end up happier & less stressed. I learned these lessons from my mom… taking care of your kids is so important. 5. DON’T PUT SO MUCH PRESSURE ON YOURSELF. Sometimes I feel like we put so much pressure on ourselves and our kids to be perfect. So many people worry about having their kids in the best sports and at the best schools and I can’t say that I don’t stress about this, as well. The same thing goes for meals. Don’t stress about having the perfect dinner. If you make chicken nuggets for the third time this week, that’s OK! As long as you are giving them some fruits and veggies to go with it, what does it matter? We all need a “pass” and some nights we just aren’t feeling up to making a great meal. Our kids love when they get a “free dinner” night (usually on baseball nights). They get to pick whatever they want- even oatmeal and fruit or pizza & an apple. They are really so excited about this! I would say about once every week or two, we have a “free dinner” night and I have very happy kids! 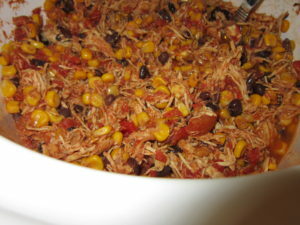 Here is a simple recipe that takes a few minutes to prepare (in the crockpot) and it is a hit for our whole family. Combine all ingredients in your slow cooker. Cover and cook on high for 4-5 hours or low for 8 hours. The chicken will be very tender when ready. Shred chicken with a fork and stir to combine. Serve alone or over rice, topped with cheese and a dollop of sour cream. Getting your family to help with the chores is important! You can not do it all and if you are doing it all, you are not teaching your kids to be responsible. If they are not responsible kids… guess what? They won’t be responsible adults! In our house, a messy house makes me feel a little anxious, which is not fun for anyone. I like to have things cleaned up, for the most part, so that we can get on with our day and enjoy it! If I have dirty dishes in the sink & clean dishes ready to be unloaded, it just weighs on my mind until I get it done. I love to get out, even if its just taking a walk. Just put everything on hold & get out. Run to the library, go to a playground, sit and read at Barnes & Nobel while the kids play with the kid toys, run & get yourself a coke at a drive-through, get outside & kick the ball around with your kids. Play dates are great for this! Call up a friend & ask them to meet you and the kids at the park or meet at a walking trail. Sometimes, its just nice to have a change of scenery. 8. FOCUS ON THE POSITIVE. We ask our kids at dinner “Tell me one good thing that happened to you today.” Or “Tell me your favourite part of the day.” We never ask them about their worst part of their day, because we want them to focus on the positive. It makes you see things in a better light. I even use this reward system, to focus on the positive. It works WONDERFULLY in our home. I used it in my classroom, as well. 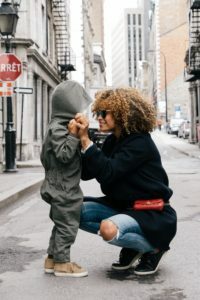 You, as a Mom, need to focus on the positive, too. I read once that you should keep a journal of good things. Make a list of three things every day that made you smile that day. n my opinion, the routine is the key to any successful day! Our kids know just what to expect from our day and it makes things so much easier! I do not need to remind them to “come downstairs for breakfast” after they get dressed or to “get into bed” after our book at night. These things are just natural. Just as you would wake up, brush your teeth and get dressed, the kids have come to learn their routines and do the same thing. They know what will be happening next. It makes life so much easier to be on a schedule, in my opinion, as long as you are OK to be flexible when you need to be! Being prepared makes things easier, too… like school mornings. 10. PHYSICAL TOUCH & QUALITY TIME. How many times have you hugged and kissed your kids today? Doesn’t it make everyone happier? How many times have you told them that you love them? What about telling them that you are proud of them? My brother tells his kids every day that he is proud of them for something specific and the reason for it. I make it a point to tell my kids that I love them, a lot! Every day I will say something along the lines of… “Oh my goodness! Come here! I have something SO important to tell you!” To which they will say “I know, Mom… you love me.” When I ask “How did you know?” they say “Because you tell me every day.” Music to my ears… I just love these kids.